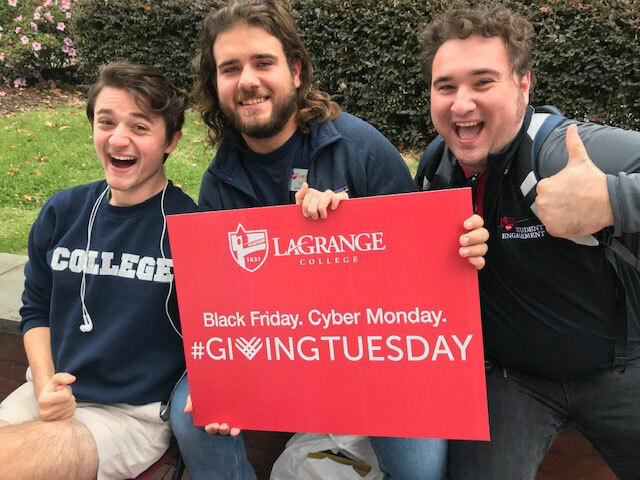 When Rick de Treville ’68 was asked to be a volunteer during last year’s #GivingTuesday event, he thought back to his days at LaGrange College – especially to one English professor who issued him a wake-up call. Calling it “tough love at its finest,” de Treville said her words resonated. But it saddened him that she never knew how much he appreciated her. So, working with last year’s #GivingTuesday campaign, he reached out to classmates who may have had similar memories. “This was a perfect opportunity to give back to LaGrange College in honor of her, and all the other caring professors and mentors who have helped so many students like me realize their full potential,” he said. He and his group of seven all designated Dr. Williams as their honoree, and raised $2,050 for the drive. This year’s #GivingTuesday event is Nov. 27. It is an internationally recognized day of giving held annually on the Tuesday after Thanksgiving, following shopping events Black Friday and Cyber Monday. The day kicks off the holiday giving season with a goal to inspire people to collaborate in improving their communities and to give back in impactful ways to the charities and causes they support. Anabeth Ivey, LaGrange College Fund Gift Officer, said she is excited to build on the success of last year’s drive. One of the most rewarding parts of the project for Ivey is working with the alumni volunteers. The Panthers (10-9) ended their 2018 season with a 2-1 loss at Maryville in the first round of the USA South Tournament on Tuesday. Matthew Fritts scored off an assist from Connor Liney for LC’s goal. The 10 wins tied for the second most in the program’s history. LaGrange (10-12) had its season end with a 3-1 loss to Piedmont in the first round of the USA South Tournament on Tuesday at Covenant College. Jazzlyn Kenner led LC with a match-high 19 kills. Senior Lauren Sanders finished fourth on the school’s career assists list with 2,117. The Panthers (2-6, 1-4 USA South) lost 38-34 at Brevard in a USA South game last Saturday. Quarterback Caleb Speir threw for 212 yards and three touchdowns. Brendon Scott ran for 116 yards and two touchdowns. LC hosts Methodist for Senior Day on Saturday. Kickoff is 1 p.m. Nursing students will host exhibit booths from 11 a.m. until 12:30 p.m. Wednesday in Corn Auditorium and the library plaza featuring health topics aimed at college students. Registered nurses from the RN-BSN program will present about 15 minutes before students tour the exhibits. State Rep. Bob Trammell (Democrat) and State Rep. candidate Vance Smith (Republican) will appear together to talk about party positions, the 2018 election and areas of bipartisan unity at 11:15 a.m. today (Friday) in Corn Auditorium. They also will take questions from the audience. A benefit concert for the Black Student Union will be held at 7:30 p.m. Tuesday in Beason Recital Hall at West Side. Brian Carlisle, Vice President and Dean of Students, and Caitlyn Deal, SGA president, will host a porch chat on the front porch of Smith Hall at 10 a.m. today (Friday) and 1 p.m. Nov. 9. Students are invited to grab a coffee, pull up a rocking chair and get to know campus leaders. Don’t forget to set your clocks back one hour Saturday night as Daylight Saving Time ends.